This is the way it should have looked were we to have had a clear day. 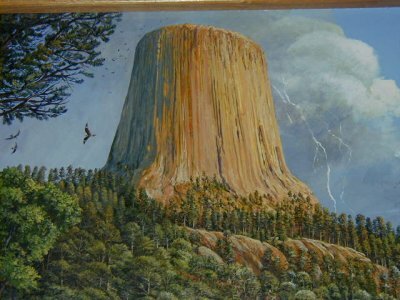 Actually this is a picture I took of a painting that was on the wall in the Visitors Center. 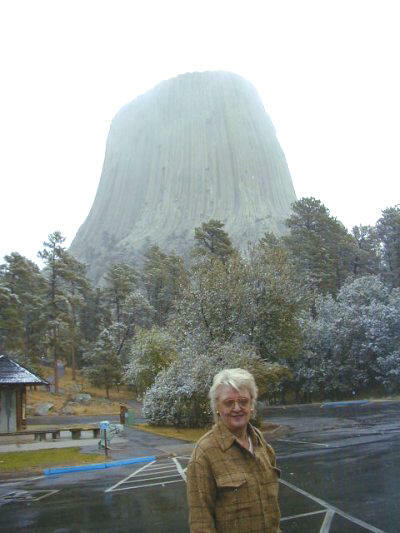 It was very poor weather when we got to Devils Tower. While it was beautiful yesterday when we were at Crazy Horse and Mt Rushmore, the weather turns bad overnight. The temperature was hovering around freezing (32). The snow stuck to the grass, but not to the roads. It was very overcast and we did not think that we were going to be able to see the Tower but we went there anyway. Per the below photos we could see the Tower.